Thank you for your help today Karen. As I said Holly didn’t show any cancer cells in the urine on this occasion (her first test) but the vet said this is not a difinitive test and cells would not necessarily show in the urine. Carrots – both dogs go mad when I open the carrot drawer in the fridge and now even more so since they have possible cancers, Hamish confirmed as I told you. He actually pinched a whole bunch from my shopping bag last month and I found him munching his way through them! Maybe they know something we only think we may know. 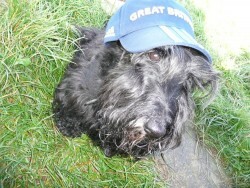 I hope other Scottie owners can take heart from his story – 14 years old today and diagnosed with terminal ductal liver cancer over 3yrs ago for which there was no treatment, he was given 2 months max to live by three expert vets. He still bounces along and loves his life, and his dear little girls Scottie Holly and Burmese cat Lucy. All he has had is Metacam, lots of love and cuddles and the unbroken routine which makes him feel safe. Interesting to learn about vegetables, especially carrots, being recommended for Scottish Terrier health. From the time my two Scotties (littermate) were about a year old, I cooked a meat and vegetable mixture for them. I used a variety of vegetables each week, usually including carrots and celery, and whatever other fresh vegetables I had in the kitchen. The kitchen smelled like homemade chicken soup when the mixture was coking. I varied the meat each week, from ground turkey, ground beef, chicken liver, etc. Every day, I fed them each a serving of high quality kibble to which I added about a about cup of the warmed meat and vegetable mixture. No complaints from them! They loved it. Jock lived to be 16 years old eating this diet. His brother, Duncan, lived to be 13 years old. Neither had any type of cancer. They were wonderful lads and we still miss them. As you will probably know by now Holly was subsequently diagnosed with transitional cell carcinoma bladder cancer. She was treated with Metacam and I gave her cranberry extract to keep urinary tract infections to a minimum. She lived for over two years without any pain or worry to her and she got used to the long time it took each time she had a wee. We eventually kept puppy training pads down for her so she didn’t need to keep going out. She had been craving carrots and raw vegetables for a few months before her diagnosis and I now think this is a case of animals self medicating. Hamish lived to be fifteen and a half, his liver cancer had stayed with him for over five years with no symptoms. Both dogs gave dna samples for research into cancer in Scotties. I just wish they could find a way to eradicate these cancers so we can enjoy a future of healthy Scotties. They are such stoic and happy dogs, they deserve a healthy future. I will always miss mine and the heartache of losing them is making it hard to think of having another at the moment but if and when I do I just hope the genetic tendency for cancers, particularly TCC, in Scotties will have been addressed and reduced. I really don’t think any dog with TCC should be bred from but it doesn’t always show up in their early years. I should add that Holly was 12 when she passed away in January this year soon after her birthday on Christmas Day which she spent opening presents and racing round the house playing with them.